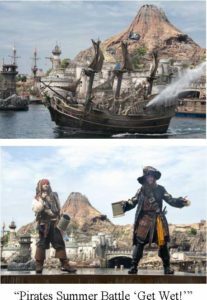 URAYASU, CHIBA— Tokyo Disney Resort® announced that Tokyo Disneyland® Park, Tokyo DisneySea® Park, the Disney hotels and Ikspiari will offer new entertainment and other exciting programs this summer. Guests are sure to create lots of unforgettable summer memories. 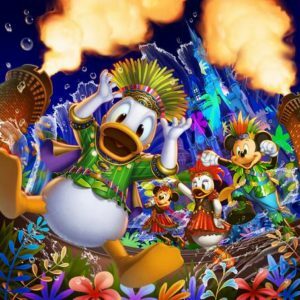 This year, the special event from July 9 to September 1, 2019 at Tokyo Disneyland will be “Donald’s Hot Jungle Summer.” With a new theme just right for the summertime, this event will offer Guests a hot, exhilarating experience at the Park. Donald Duck and his Disney Friends will appear in “Oh! Summer Banzai!”presented after dark on the Cinderella Castle stage set up for the first time in six years. This brand new show, overflowing with excitement, is set in a colorful jungle with tons of water spraying everywhere and powerful flames adding energy to the action on stage. 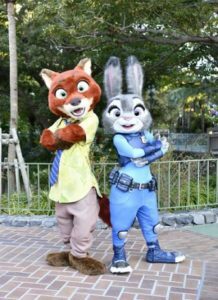 Taking place during the daytime will be “Judy and Nick’s Jumpin’ Splash,” featuring Judy Hopps and Nick Wilde from the Disney film Zootopia. 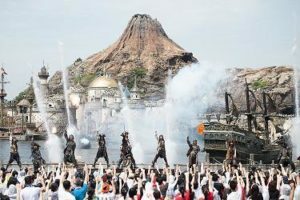 Guests will be able to enjoy this entertainment program with its cool and refreshing blasts of water spraying all around. 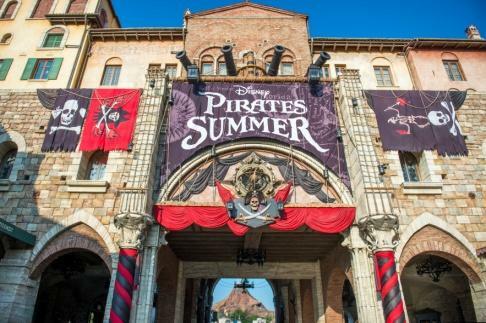 Tokyo DisneySea will again present the special event “Disney Pirates Summer” from July 9 to September 1, 2019 Captain Jack Sparrow, Captain Barbossa and a rowdy pirate crew will be back for the entertainment program “Pirates Summer Battle ‘Get Wet!’” Guests will be caught up in the exciting world of pirates inspired by the Disney franchise Pirates of the Caribbean and are sure to get drenched with lots of water. 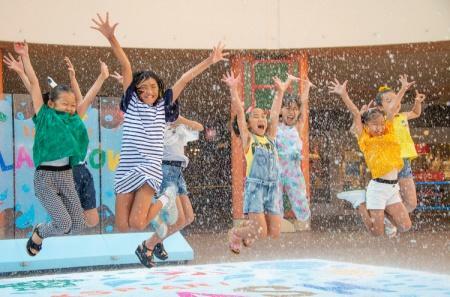 The Disney hotels, Disney Resort Line and Ikspiari will also be offering exciting programs during this period, ensuring a fun-filled summer throughout Tokyo Disney Resort. This new nighttime entertainment for the summer will feature the impressive use of flames and drenching sprays of water for the enjoyment of Guests. Making use of the stage in front of Cinderella Castle for the first time in six years, this show transforms Tokyo Disneyland into a colorful and lively jungle. Donald Duck, Mickey Mouse and other Disney Characters in vivid costumes perform to the lively music building up a hot and enthusiastic ambience. The summer night in the jungle heats up even more with flames shooting up, tons of water spraying and images projected over the stage. The Disney Characters and the Guests will share the excitement of this fantastical jungle night. Note: Entertainment programs are subject to change or cancellation due to weather and other conditions. The number of performances may also change without notice. 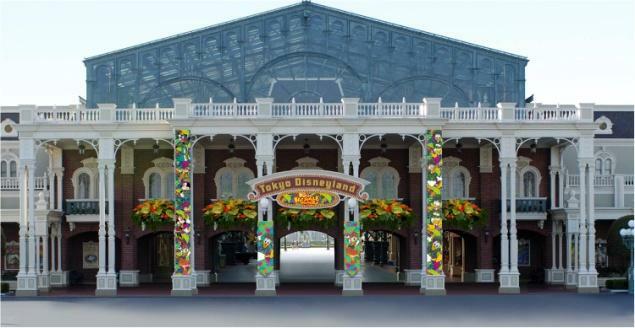 The Park’s Main Entrance will be decorated with images of the Disney Characters in colorful costumes to help create a jungle atmosphere of excitement and summer fun. About 80 different types of merchandise for “Donald’s Hot Jungle Summer” will be sold in the Park. Just right for summer will be T-shirts, shorts, plush badges and other items that friends can coordinate to have even more fun in the Park. After dark, the colorful glow bracelets are sure to catch everyone’s eyes. Also available will be a wide variety of striking products, including Donald Duck body pillows and tissue box covers in the shape of his face. Notes: Special merchandise will be available from July 8, 2019. Special merchandise items are subject to change without notice. Some items may sell out or sales may end before September 1, 2019. Adding to the dynamic atmosphere of flames and water created for “Donald’s Hot Jungle Summer” will be 12 different types of special menu items. 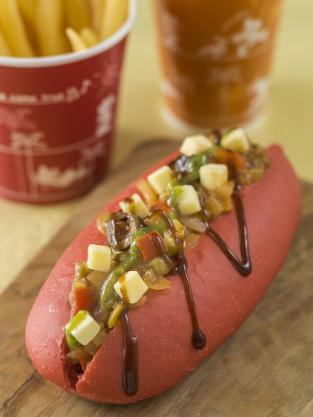 At Refreshment Corner, hot dogs with vegetable sauce in a fire-inspired red bun will give Guests some hearty energy. 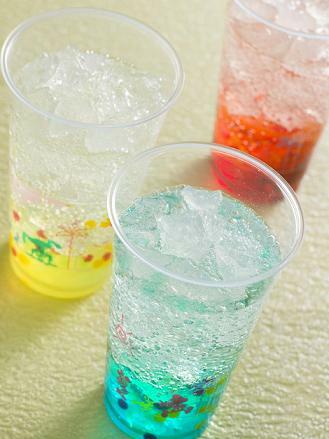 Served up at Boiler Room Bites, Captain Hook’s Galley, and Huey, Louie and Dewey’s Good Time Cafe will be colorful soft drinks in blue, red or yellow for a cool and refreshing way to chase away the summertime heat. In addition, Donald Duck-inspired desserts that come with a souvenir cup or souvenir plate will also be available. Notes: Special menu items will be available from July 8, 2019. Special menu items are subject to change without notice. Some items may sell out or sales may end before September 1, 2019. Judy Hopps and Nick Wilde from the Disney film Zootopia will appear in this new show with lots of splashing water. Guests will be able to enjoy this cool and refreshing show set to Zootopia’s theme song “Try Everything” and other happy, lively tunes. Back again this year is this entertainment program themed to the world of the Pirates of the Caribbean films. In the show, a crew of pirates led by Captain Barbossa takes over Porto Paradiso in Mediterranean Harbor. Captain Barbossa appears aboard a legendary ship as other pirates prowl about the harbor shores. In an attempt to recruit members for his crew, Captain Barbossa puts the Guests through some pirate training with lots of splashing water. Just as the Guests and the pirates form a bond, Captain Jack Sparrow makes an appearance. Jack Sparrow, the longtime rival of Captain Barbossa, proposes to set aside their past issues. He invites the Guests and the pirates to celebrate together as tons of water shoot out over them. But in an unexpected turn, Jack Sparrow transforms the celebration into a fierce battle over the legendary ship. The heat of the summer will be forgotten as Guests are immersed in a world of pirates through this thrilling performance enhanced with water and fire. 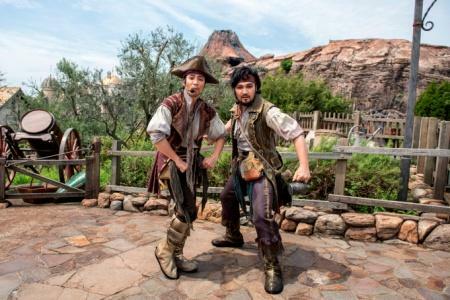 Atmosphere entertainment at Mediterranean Harbor will feature a buccaneer trainer who encourages Guests to participate in some more training to become a pirate. And a variety of unique pirates, including Captain Jack Sparrow, will greet Guests during this summertime event. 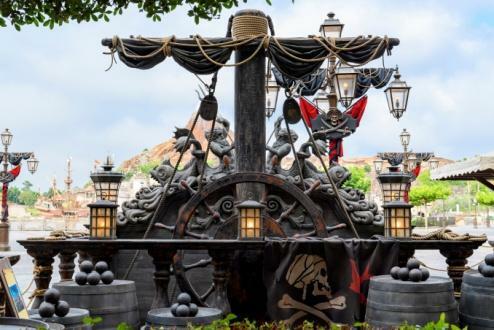 Around Mediterranean Harbor will be pirate-themed decorations including flags with a skull-and-crossbones motif and parasols in black and red. Also in the area will be a photo location where Guests can take pictures that look like they are on a pirate ship. About 70 different types of products will help Guests get in a pirate mood during the special event. 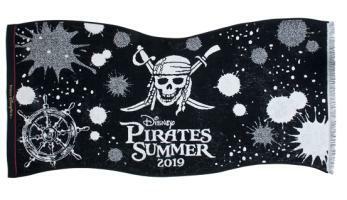 A pirate flag design inspired by the Disney film series Pirates of the Caribbean will feature on T-shirts, bath towels, wristbands and other items. Also available are glass mugs that match the dynamic image of a buccaneer. Designs of the Disney Friends in pirate attire will be used on T-shirts, pirate ear caps, and other items. Fun and exciting toys will also be available. Notes: Special merchandise items will be available from July 8, 2019. Special merchandise items are subject to change without notice. Some items may sell out or sales may end before September 1, 2019. Guests will be able to enjoy 16 different types of special dishes and cocktails inspired by pirates. Cafe Portofino will be serving a special set that includes pasta topped with a batter-fried fish fillet. Tart, but refreshing, this dish is perfect for a hot summer day. New York Deli and Mamma Biscotti’s Bakery will both offer menu items inspired by pirates and the ocean. Guests can feel just like a buccaneer as they toast with some of the new cocktails that will be available. 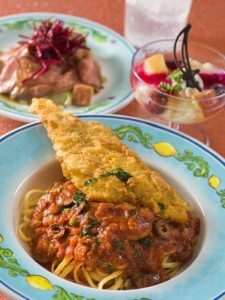 At the Tokyo DisneySea Hotel MiraCosta® restaurants, Guests will be able to enjoy special menus and special drinks with a collectible glass, all inspired by the Tokyo DisneySea special event “Disney Pirates Summer.” Also available for this limited period only will be unique souvenir medallions. 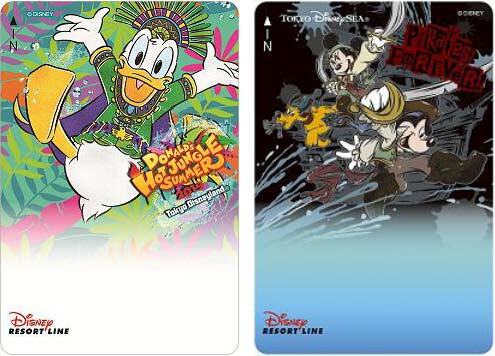 The Disney Resort Line will offer day passes with two different designs, one inspired by the Tokyo Disneyland special event “Donald’s Hot Jungle Summer” and the other by the Tokyo DisneySea special event “Disney Pirates Summer.” These tickets will be sold at the ticket machines at each monorail station. Guests can also purchase souvenir medallions that come in a Disney Resort Line original design. In addition to plans that include special seating (areas) for viewing the summer entertainment programs, Tokyo Disney Resort Vacation Packages also offer accommodations plans that will help children create some unforgettable memories of their summer vacation. The “Custodial Kids!” program allows children to experience what the Custodial Cast Members do. And in the “Venetian Gondolas ‘Kids Gondoliers’” program, children will be able to actually row one of the boats at the Venetian Gondolas attraction in Tokyo DisneySea. Please see the Tokyo Disney Resort Online Reservation & Tickets website in English (https://reserve.tokyodisneyresort.jp/en/top/) to find out more about Tokyo Disney Resort Vacation Packages. restaurants and cafes will serve chilled sweets.